Lost March got even better with the release of Team Up. The deck was already incredibly powerful before, but with the Emolga option and Pokémon Communication to improve consistency, the deck has become even more of a force to be reckoned with. Both of these cards actually go hand in hand to make the deck flow much smoother. Formerly, you had to use Ultra Ball for added consistency but now you can audible to Pokemon Communication and exclude Ultra Ball altogether if you want. The deck already functioned well and has topped many events, but the greatest and latest list is even better. I love being able to play cards with little drawback and Pokemon Communication has been a dearly missed card that does just that. It works even better in this deck than most cards as you play so many Pokemon and you never want to have Jumpluff in your hand. In one fell swoop you can unclog your hand and get Jumpluff back in the deck so you can go ahead and use Floral Path to the Sky. Control decks are on the decline as is Decidueye-GX, so there’s no time like the present to pick up Lost March and go to town. Control is weakened by the release of Pikachu and Zekrom-GX, the rejuvenation of Malamar with Team Up, and the continued presence of Blacephalon-GX, which is just a bad matchup. Formerly this deck’s worst enemies, there’s really nothing sitting in the way of it just crushing the metagame like Night March did back in the day. Albeit a more fragile concept with more margin for error, this deck is much like its predecessor and arguably better because it lacks direct counters. This list has been tested heavily and approved by my testing group. I think this is the best list for Lost March right now and a perfect deck choice if you’re looking to pick something up last minute for a Standard format tournament or even as a play if you’ve tested profusely. It’s a simple deck and simple strategies are the hardest to disrupt. The power ceiling is practically infinite; you can take OHKOs on any Pokemon in the game within reason. Emolga makes this deck flow. You find one early and it becomes a pivot to push up after every Knock Out since it has free Retreat and you can use it to thin the other Emolga out of the deck. I wouldn’t quite say it’s like playing a 56 card deck, but it’s close. That’s good in this deck since your strategy is so simple and you want to be able to just execute it with ease each game. Emolga has Lost Blender synergy and can become three additional Lost Zone Pokemon in the best case scenario. 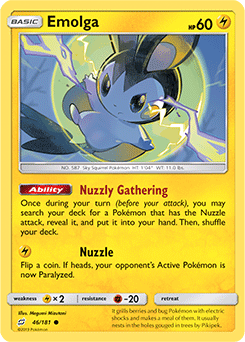 It makes your Pokemon Communication pop off as well without a hitch as you can just pull an Emolga out of the deck with Nuzzly Gathering and put it back in with the Item. Three Emolga is an option if you’re looking for space, but like a card like Lillie, I’m not interested in playing anything less than four because you’re just not getting the best value out of the first time you use it if you aren’t maximizing your count. Like take Lillie, you just don’t use it on your first turn and becomes significantly less valuable. Likewise, with Emolga if you land on in your Prize cards then you’re in the same sort of situation. You want to play for to be able to get them all in the Lost Zone with Lost Blender and to improve your early game while still having some that are disposable with the aforementioned Lost Blender. Four isn’t quite essential since you already have so many attackers and Rescue Stretcher to get them back if you need to. Four is okay to have another optimal starter, but the thing there is if you don’t start it then you’re just playing it for no reason. It’s a Lost Blender target as well like anything, but three has just always felt right. Not too many but not to few, I like a fourth if you’re not playing Emolga, but it’s one of the spaces I used to free up the space for the Emolga. Let Loose is the main draw engine of this deck and its “replacement” for Tapu Lele-GX. You don’t want to be playing a Pokemon-GX in a deck like this where non-GX Pokemon are the name of the game. Non-GX decks like this garner much of their advantage from giving opponent’s only a single Prize at a time so any spot where you could weaken that advantage is a bad idea. Let Loose is also extremely disruptive in the Standard format, especially on the early turns. This deck can recover from it since it has so many playable cards and can even Bench Oranguru to Instruct and recover that way if needed. I could see going up to three if you felt the need to, but you don’t exactly want to have that many of your Bench spaces eaten up by a support Pokemon so two has felt good enough. While this list isn’t running Ultra Ball anymore, you still want to play Oranguru because you can still thin your hand down to the point where Instruct has some value. Instruct is a great way to speed through your deck and have more explosive turns, but without Ultra Ball it is less good; that’s mainly why there’s only a single copy. Oranguru can attack, don’t forget, Psychic is decent if you have a turn where you get ahead on Energy attachments if your opponent fails to Knock Out one of your attackers.